Perfectly Pamela: Top Two Tuesday - Shopping! Today's topic is Top Two Favorite Stores to Shop. I love Old Navy. I have shopped there since I was 17 and I keep going back. Some seasons the clothes are horrible, but things are getting back in style and I can't wait to go do some spring shopping! They also have THE BEST clearance sales! This store has some of the cutest clothes, period. The only thing that bothers me about the store itself vs. the online store is that you can't always find things in store to try on that you like online. I love shopping here and I always say I'm going to buy this and that off the website, but I end up shopping in the store instead. In fact, my Bachlorette Party dress is from Body Central! Thanks for linking up girl! 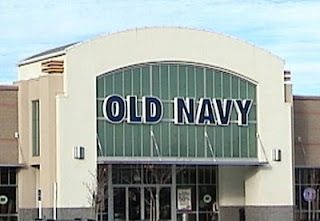 I love Old Navy too! I have never heard of Body Central but Im off to check it out now! hmmm....never heard of Body Central..I will have to check it out!! Old Navy is always a must.! They have such great sales.! !